Mike Miller, a native of Delaware, began his career in funeral service in 1975. Since that time, Mike has been honored to assist many families throughout the tri-state area with professional and compassionate care. 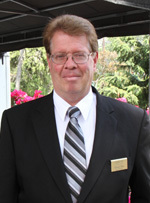 His devotion to funeral service exemplifies his commitment to the families that he has served. Mike currently lives in the North Wilmington, Fairfax area. Mike is an alumni of Salesianum School and he is a member of St. Mary Magdalen Catholic Church. He is a life-time active member of the Talleyville Volunteer Fire Company, where he has served his community for 43 years. In addition, he serves as the Vice Chairman on the Board of Director’s for the fire company. Teresa is the Office Manager for Gebhart Funeral Homes. She was born in Port Chester, NY, raised in Greenwich, CT and attended college in Franklin, MA. She relocated to Delaware in 1984 and has been with the funeral homes since 1987. Teresa provides support to the funeral staff and passionately assists families with sincere dedication at both the Claymont and New Castle locations.